When I had three babies in less than three years (yep, twins), people had the impression my life, as I knew it, would be over. I would swap my professional career outside of the home to be a stay-at-home mom (something I am just not built for). I would sell my SUV for a minivan and the only way I could possibly leave my zip code would be if I was bound for errands, doctors’ appointments or a kiddie-focused event. This was not going to work for me. I don’t have a minivan for a number of reasons. Instead, we found the narrowest car seats on the market (i.e. Diono), put three car seats across my second row and we have taken plenty of long drives from Ohio to New Jersey, the other side of Pennsylvania and Maryland to visit friends and family. Have kids, will still travel. 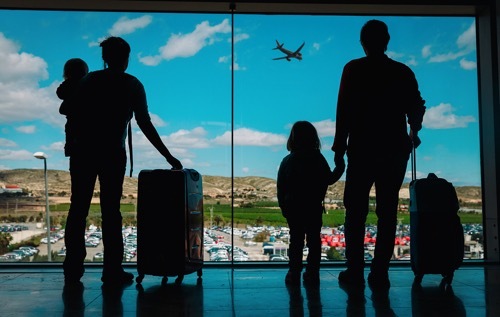 I have blogged about traveling on a plane to California with three small children, and how to Send Vacation Woes Packing with these Family Travel Tips but where do you start if you have dreams of traveling overseas? Your travel dates may have limitations depending on your budget because traveling off-season will be less expensive. Travel dates could be impacted by what you do for a living and how much earned time off you have available (for example, teachers have the summer off, but limited time off the rest of the year). Additionally, if your kids are in school or extra-curricular activities, you need to plan around games, tournaments, recitals, etc. With my oldest in school, we are bound by the academic calendar (more flexibility could be a perk of homeschooling), so we’re limited to summer, winter and spring breaks for bigger trips. Even so, there are many long weekends we can leverage and turn into a family vacation. Disney is not my first choice (sorry, Disney devotees). Since welcoming my gaggle of girls, we have road-tripped to Michigan and the Finger Lakes, N.Y., and countless trips to the east coast. We have flown to Florida (the aforementioned Disney trip), San Francisco and the Dominican Republic. We are kicking it up a notch this year with a trip to Ireland. Kids are pretty easy to please, so we pick a destination not specifically tailored to the 10 years old and under crowd. This is where the bulk of the work takes place. Think about what you need to organize and do your research. Start by thinking about sleeping arrangements and how you plan to get around. What do you want to accomplish and what do you need to arrange to make it happen? Can you get by with limited sleeping space (kids sleeping in the same bed) so you can rent a 2 bedroom house or hotel room versus 3 or 4 bedroom? Do you need access to a kitchen, fridge or microwave? For example, in my Ireland research, I learned American car seats are not technically legal outside of the U.S., so renting a car outside of the U.S. means we’ll be renting car seats, too. The trade-off is we don’t need to pack car seats and lug them to the airport. When we traveled to California with twin 1-year-olds and a 4-year-old, we traveled with three car seats, two strollers (a single umbrella stroller and our City Mini double), two baby carriers, one pack ‘n play and lots of diapers. It was a lot, but airlines make it a easier by checking car seats at the ticket counter and strollers at the gate without paying extra. Negotiate because it doesn’t hurt to ask. We rented a house in California through VRBO.com. When messaging with several home renters, I told my #1 choice if they purchased a pack ‘n play, I would book their home immediately. This sweetened the deal on both sides – one less item for us to travel with, minimal cost to the owner and a guaranteed booking. Plus, now they can tell future renters they have a pack ‘n play available. As kids get older, you’ll need to pack less and you’ll be able to travel lighter. Even having my twins potty trained means we do not need to pack diapers, pack ‘n plays (because using a toilet means they are out of cribs) or potty seat accoutrements. It’s liberating! A sense of openness to adventure may be the most important item to pack. I guarantee not everything is going to go according to plan. Remain flexible and remember you already accomplished your big goal of taking a vacation. Be open-minded to whatever happens next. Attitude is everything. In summary, when it comes to making travel arrangements with kids, think about what you need, make the plans, book it and be open to adventure!